Dating back to the late nineteenth century the figure of the pugilist has occupied a consistent presence within American cinema. Yet despite the regularity with which boxing films are released, until now there has (to the best of my knowledge) been no detailed investigation of the genre. In that context alone, Leger Grindon’s Knockout: The Boxer and Boxing in American Cinema is a long overdue contribution to the study of American popular culture. According to Grindon, the ambivalence that often underscores these types of conflicts also extends to the boxing film’s representation of gender. Here, the author notes how, “Fat City (1972), with its critique of masculinity, poses many of the same gender conflicts found in Hard Times (1975), which valorizes masculinity” (7). For Grindon, the range of resolutions offered by the boxing film gives it a flexibility that “assures the evolution of the form” (7) and partly explains the genre’s longevity. Drawing on the evolutionary model of genre proposed by Thomas Schatz in Hollywood Genres (1981), Grindon’s approach offers a useful means of tracing alterations within the boxing film through parallel historical events and figures. For example, the comparisons between real-life boxers Joe Louis and Muhammad Ali and the films drawn from their respective cycles (eg. Golden Boy (1939), Rocky (1976)) highlight the boxing genre’s propensity for producing representations that distort or obscure the racial realities of a particular historical era. Illuminating the way popular culture responds to such socio-political shifts, Grindon’s work redresses the invisible underside of representation by stressing the genre’s historical origins. As he insists, “Just as Joe Louis influenced the boxing films of the classical era, Muhammad Ali became the catalyst for the comeback of the screen boxer in the 1970s” (64). Expanding upon the evolutionary framework established in this section, the subsequent chapters trace the development of a prominent theme or conflict common to the boxing film across the genre’s history. Explored through an analysis of select films, Grindon isolates the following tropes for discussion: the ‘success ethic’; the conflict between assimilation and the indigenous community; gender conflict; violence, suffering and male emotion; and the conflict between the flesh and the spirit. 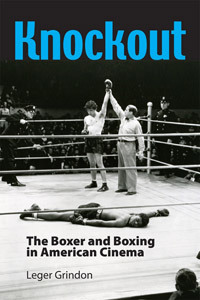 Melding analysis of various narratives with background information specifying industrial influences and providing links to other relevant films, Grindon weaves these chapters into a dense overview of the boxing genre. And even though the publication is light on detailed analyses of film technique, the work still yields a number of keen observations. For instance, Grindon’s appraisal of the oft-derided Every Which Way But Loose (1978), a film that out-grossed Rocky II (1979) in domestic box-office upon release, presents a convincing argument for the work as “more complex and coherent than critics perceived it to be” (92). Focussing on issues of class and individualism, Grindon notes how Philo (Clint Eastwood) questions and rejects the ‘American Dream’ but also how in the film, “[c]ommon alternatives to the success ethic – family, learning, religion, art, or romantic love – are either mocked…or portrayed as duplicitous” (92). Similarly, the comparison between two versions of The Champ (1931,1979) articulates a noticeable ideological shift in the representation of gender/parenting within the boxing film. Here, Grindon argues that while both films, “present the boxer as estranged from women and grappling with a beleaguered masculinity…the 1979 remake testifies to warlike gender relations in which the career woman emerges as the villain” (139). Such analyses emphasise the significance of the boxing genre as a marker of cultural and political change within the United States. There are a number of other worthy boxing films (both narrative and documentary) that also receive significant attention throughout the work: Kid Galahad (1937), Body and Soul (1947), Champion (1949), The Set-Up (1949), Right Cross (1950), Mandingo (1975), The Fallen Champ: The Untold Story of Mike Tyson (1993), When We Were Kings (1996), Million Dollar Baby (2005) and Unforgivable Blackness: The Rise and Fall of Jack Johnson (2005). Additionally, Grindon makes a strong case for the inclusion of some less-likely contemporary films within the canon by drawing parallels with the traits of the traditional boxing genre. Referring to David Fincher’s 1999 film the author remarks how, “Fight Club appropriates conflicts, iconography, and action from the boxing film and brings the genre into a foreign territory” where the “play of form and the provocation of the viewer finally become more important than working through the dramatic conflicts the film presents” (187). The only drawback to this text is the chapter dedicated to Martin Scorsese’s Raging Bull (1980) that appears just prior to the epilogue. Given the substantial scholarly canon already dedicated to the film (in the context of boxing but also to issues of masculinity, sexuality, violence, race, performativity and Scorsese’s oeuvre) the decision to grant such a select focus to this particular work seems a tad unnecessary. Departing in structure from the previous sections and adding little to the existing body of writing in terms of content, the work here might’ve been more effective had it been edited down and integrated into the earlier chapters. That gripe notwithstanding there is still much to appreciate about this publication, particularly in Grindon’s prose, which is both readily accessible and academically astute. And with a slew of recent films such as The Fighter (2010), Warrior (2011), and Real Steel (2011) demonstrating a clear continuance of the boxing film’s prominence in American cinema, Knockout provides a sound foundation for further investigation.